I am a huge fan of all things Canadian – I think that Canadian artisans have unique qualities and their work is often top-rate. I think that Canadian artists should be encouraged and shared with the world when they produce beautiful items. 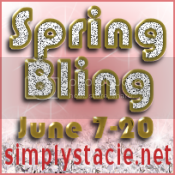 For that reason, I was really excited at the chance to do a review, and offer a giveaway, for Simply Stacie readers from Sleepy Moon Design. Zoe, the owner of Sleepy Moon Design etsy shop, is located in Vancouver, British Columbia. Sleepy Moon Design has been open since February of 2009 and she specializes in gemstone jewelry and sterling silver, though she does produce a few pieces in 14K gold as well. Zoe’s pieces include a wide variety of styles and items such as lariats and necklaces. Zoe also produces some beautiful bridal jewelry and teardrop earrings. With over 200 items in stock, the number of choices are amazing! I received an AAA Labradorite Teardrop Suspension Necklace . When I received the necklace I was amazed at how stunning and delicate it really is! 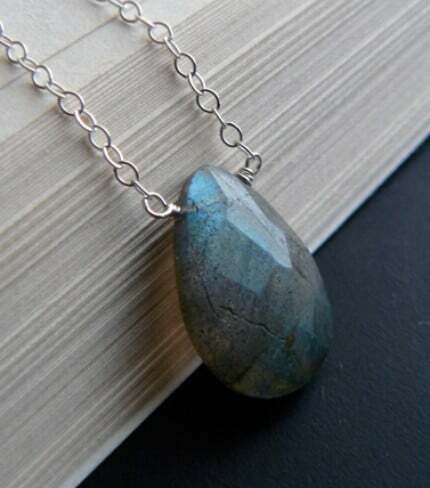 I’ve never had a Labradorite necklace and I found the stone really interesting because it is grey in colour but in the sunlight many different colours appear inside the stone which made it really beautiful and unique! I also liked how the stone is suspended in the chain so it doesn’t move when I am wearing it. While I love this necklace, in hindsight I would have asked for a slightly longer chain as I don’t generally wear shorter necklaces. While I received my necklace on a 17″ chain, I appreciate the fact that Zoe will provide a 16″, 18″ or 20″ chain depend on what the buyer wants. As well, if you want an even longer chain, you can also buy an extender at a reasonable price. Check out Sleepy Moon Design because I think you’ll find some gorgeous pieces at great prices! Love the Sterling Silver Oval Necklace – Elliptic! I like this pair of earrings very much. 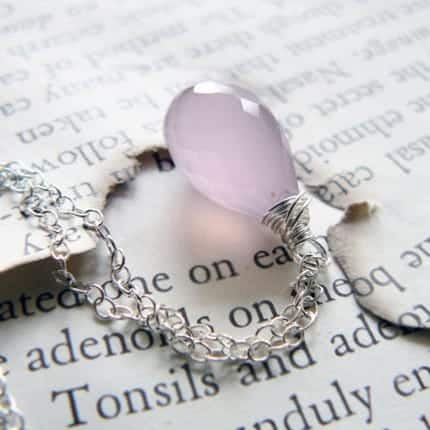 i love the Tourmalinated Quartz and Silver Dipped Leaf Necklace! I love the Green Fresh Water Pearl and Heart Necklace – Ocean Floor. Sleeping Beauty Turquoise and Ginkgo Necklace is another one I would like to get. I follow sleepy moom on twitter. Purple is my favorite color and I love lockets, so naturally my favorite piece is the Amethyst and Tourmaline Locket Necklace – Memories. Subscriber to your blog by email. Follow your blog on Google Friend Connect. Follow Sleepy Moon Design on Twitter. I love the Sparkling Aluminum Suspension Necklace! I like the Large Amethyst Briolette Lariat Necklace in Sterling Silver. Lariats are totally my new obsession!